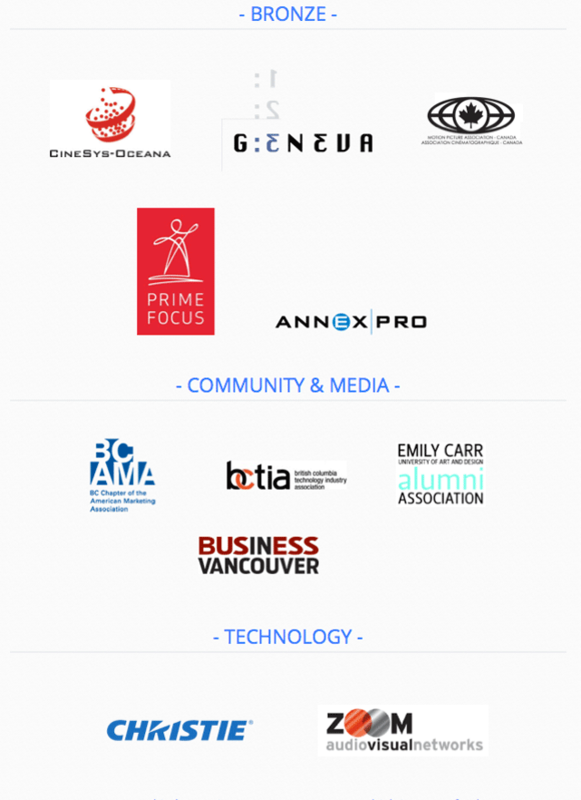 3D[FWD], held in Vancouver at the Vancity Theatre on January 24th & 25th, brought together business leaders from a cross-section of industries to explore the impact of 3D technology and emerging 3D concepts and tools. Emily Carr University of Art +Design with the S3D Centre are thrilled to have organised this event with the International 3D Society, with support from National Research Council’s Industrial Research Assistance Program (NRC IRAP). This event couldn’t have been possible without the support of those organizations, and also our friends at Massive Media. This was the banner event for the recently created Canadian Chapter of the International 3D Society. More information will be available at the Chapter website in mid February. Audio and videos will be hosted there from the event and future events. If you are interested in becoming a member of the Society, please contact us for more information. 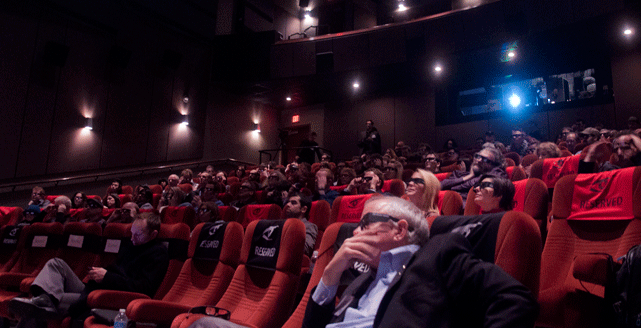 Over 130 attendees came to Vancity theatre on the 25th of January to listen to some of the best 3D leaders in the world. We were treated to 4K 3D presentation of content from our speakers thanks to Christie Digital stepping in with a model CP4230 projector. The content was not only in brilliant hi-res 3D, but was BRIGHT! Our fantastic A/V team from Vancity Theatre and Zoom A/V made sure the projector and Dolby 3D system were installed in time, and that all the speaker’s presentations flowed without problems. The most exciting thing Chabin spoke of was that patents for 3DTV, 3D devices and technology are exploding in huge numbers. Companies are certainly looking at 3D and preparing for the future. The professional community is both excited and hesitant over 3D, this is due to a large amount of mixed information, new information, and brand new technology. Chabin discussed auto stereo as the next movement in the entertainment and consumer landscape. “It has already started, products are being rolled out and content created for them.” In regards to the adoption of consumer 3DTV, Chabin said “Whatever TV you buy is going to be 3D ready, price is no longer an issue. Prices are going down and more people are going to have a 3D TV than not within the next couple of years.” Chabin stated that their are millions of 3DTVs now in homes around the world, and displayed a graph showing the surge in growth. It was discussed that commercials in 3D encourage better retention from consumers than repetitive commercials in 2D, and the figure of 40% increase in retention for schoolchildren who watched educational material in 3D (compared to 2D) was presented. Chabin stressed the importance that from architecture to medical, and military to Nano technology, professionals have already been using 3D technology and will need to become familiar to 3D. For example, the Mars Curiosity rover has 2 3D camera systems onboard, and this addition greatly influences the scientists’ ability to drive the rover over Mars’ terrain. 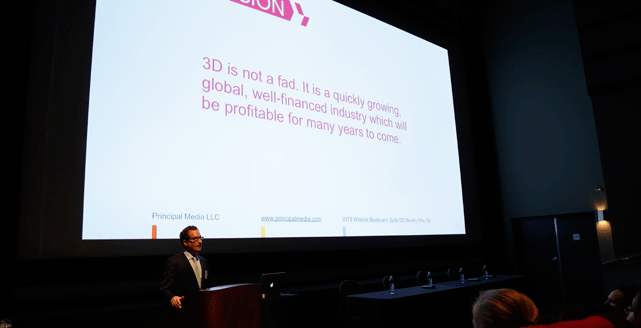 Chabin gave some examples of successful business people that were among the first to embrace and invest in 3D. Steve Jobs was used as an example, having been involved in 3D from the early 2000s. “You are part of a very, very cool club. When we concise information from our business and organizations, it becomes obvious front he statistics that 3D is considered by consumers to be a premium and enhancement on everyday experiences.” “We have come a long way in just a few years, HD and colour TV took triple the time to get where we are today”. Brenner used the example of an S3D Centre staffmember’s ongoing project and how it could generate income and reach audiences. “Hire an experience narrator, and have them create a professional delivery.” He stated that in many cases, once you study successful campaigns for short form 3D content you may quickly realize they all have the same formula: quick, punchy titles, a subject matter that uses 3D creatively, and a professional delivery of narration and visual effects. It is clear from Brenner’s talk that there are many areas we have not been considering when selling 3D content- for example, to 3D technology companies such as LG or Samsung even. In the Q&As, there was some discussion as to why Canada’s distribution model is so much more underdeveloped compared to the USA and UK models. Attendees expressed their concern and not being able to catch the eye of local broadcasters who could consider a 3D initiative. TELUS 3D Optik network was brought up as an example of a network that has a 3D channel, but does not purchase content. Brenner was able to suggest several strategies for how Canadians could market their content to the US networks, while maintaining rights over the content for further use. Many of the attendees walked away with a broader understanding of how to finance and sell their 3D projects, and Brenner was able to answer some of the most pressing questions from our local media community. 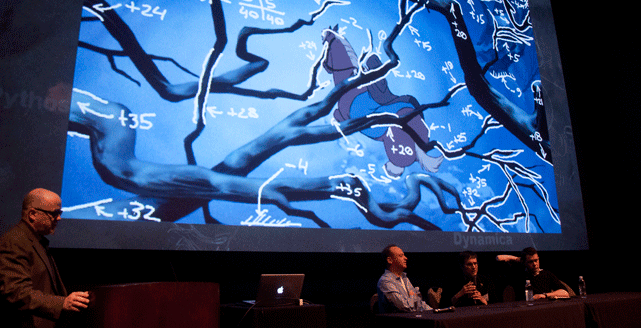 Session 3: PANEL: Telling Your Story in 3D with Adam May, Vision 3; Robert Neuman, Disney; & Joshua Hollander, Pixar | Moderator: Buzz Hays, True Image Co.
We watched clips from Pixar’s “Brave”, Disney’s “Tangled” and a compilation of Vision3′s project to kick off this panel session, with all three being extraordinary in immersiveness and 3D skill. The scene from “Tangled” called ‘Lanterns’ was the recipient of Scene of the Year at the Society’s 2nd Annual 3D Creative Arts Awards, and it was clear how this scene won by a landslide. It had every checklist element of 3D one could wish for 1) good character roundness, 2) 3D that flowed seamlessly between positive and negative parallax and 3) interesting story elements that took advantage of the very nature of 3D. Neuman entered the industry wondering how 3D could be used as another tool in the cinematographers’ tool belt, and what the 3D grammar/language would look like. He created a 3D language for Disney and began working in 3D in “the most organic part of the creative process of the film as we could”. “The 3D you see isn’t just the literal stereoscopic geometry between the left and right camera, it is often composed of 8 stereo layers that include the characters and environment”. Hollander: “We wanted to resurrect some of our old titles at Pixar, and see what that would look like. As a result we got approval to do “Up” in 3D, and we started an aggressive testing, experimentation, and education campaign in the company. In the beginning we kept the 3D subtle in those early days, and since then as our understanding and sophistication of the medium has increased, we are doing more multi-cam and involved 3D usage”. All four panelists discussed the use of convergence as a subtle tool, and how each of them approaches convergence with interaxial. Neuman states that he looks always at comfort first, and also what the main subject is. He stated that he tracks the viewers natural focus point as close to the screen (converged upon at the screen plane) as possible. May discussed his approach in live action, and how nothing can truly be fixed and 100% controlled on a shoot. But he did state that as a general rule, they try to converge on the furthest point in a room. “It ticks two boxes. When shooting converged, it is an immediate 3D reference on the shoot, but also you still have some level of flexibility in post production”. In terms of editing, May explained too that they reduce the depth in faster cut sequences and use depth in a rhythm with the edit pace for the story. He utilizes depth scripting considerably, not too dissimilar to how animated films operate. Hollander explained their influence at Pixar from scientist Archibald Stanley Percival’s’ philosophy of the ‘zone of comfort’, and how the ocular system operates with physical space. “We converge on where the audience is focusing, and use negative and positive parallax for emotional impact.” Hollander describes a terrific scene from “Up” where 3D is used with colour to create incredible emotional impact on the audience. As the scene progresses, the colour saturates and the 3D depth increases coinciding with edit cuts. This was a terrific example of how 3D not only improves upon, but also in some cases creates an emotional intensity not otherwise possible without 3D. Hays states “There is a lot to talk about with the creatives on this topic. And sometimes you have to explain this to a non-creative, who isn’t as passionate about 3D. 3D should never be an afterthought, because you are not taking into consideration the framing, the depth, the emotional aspects that 3D can create.” He went on to say “there are more bad 2D movies than 3D. But 3D is the new kid on the block, so you feel like you can punch him in the gut when you need some validation.” Hays promoted experimentation if it is possible prior to a project as a safe place to make errors and figure out what will work with the project. He also explained how directors like Baz Luhrmann and Robert Zemeckis were able to see the potential of 3D to become an intimate and emotional contribution to a story, and add a new level of creativity to the film. We were able to view some of Vision3’s 2012 Olympic indents, which were truly breathtaking in not just 3D, but also shot at high speed for slow motion. We also watched a short by Pixar, called “Night and Day” which takes advantage of 3D in one of the most unique ways yet. Parallax Films showed some clips from “Blowdown”, “Battle Castle”, and an upcoming graphic novel they are creating. 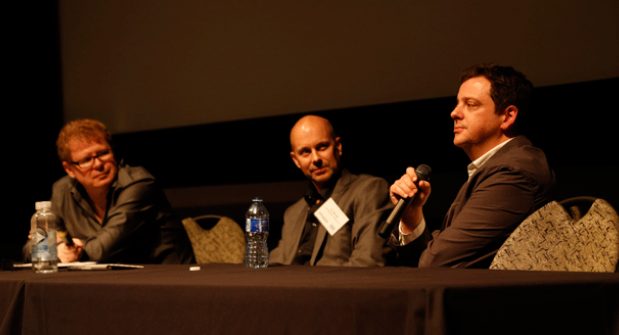 Cowan stated that “3D in Vancouver has had a bit of a love and hate relationship. As a major production Centre, we were inundated with feature film work that used US 3D crews. Som many people here haven’t had their services used even yet.” On “Piranha 3DD”, Cowan completed all the 3D post production on the film with Technicolor in Vancouver. Ian Herring had great information for the audience about their “Blowdown” structural implosion project in 3D of a major football stadium in Brazil. He spoke to the difficulty and also perfect storm of conditions that led to working with a demolition team for National Geographic, and being able to test their 3D pipelines simultaneously with National Geographic. In their 3D episode of “Blowdown”, they had to build actual custom 3D capture systems and also used a Canon 5D beam splitter, many security cameras, and manage to edit the content form these systems seamlessly together. Cowan echoed this by discussed the challenges doing DI and stereo grading on “Piranha 3DD” due to having so many multiple camera systems including Red cameras. He explained their process for making the mixed content balanced not only in colour, but also balanced in stereo. “Every single frame of that started from 2D,” starts Mark Lasoff after their sizzle reel finishes. For the kind of projects Gener8 completes, there is a large VFX component to the film- so Gener8 works not only of converting 2D capture, but also completes VFX shots. Lasoff continues that they get three kinds of films; 1) 2D that needs to be converted to 3D, 2) films shot in native 3D but for cost reasons included 2D with the intent on converting, and 3) native 3D shots that need to be converted due to errors or re-shoots. 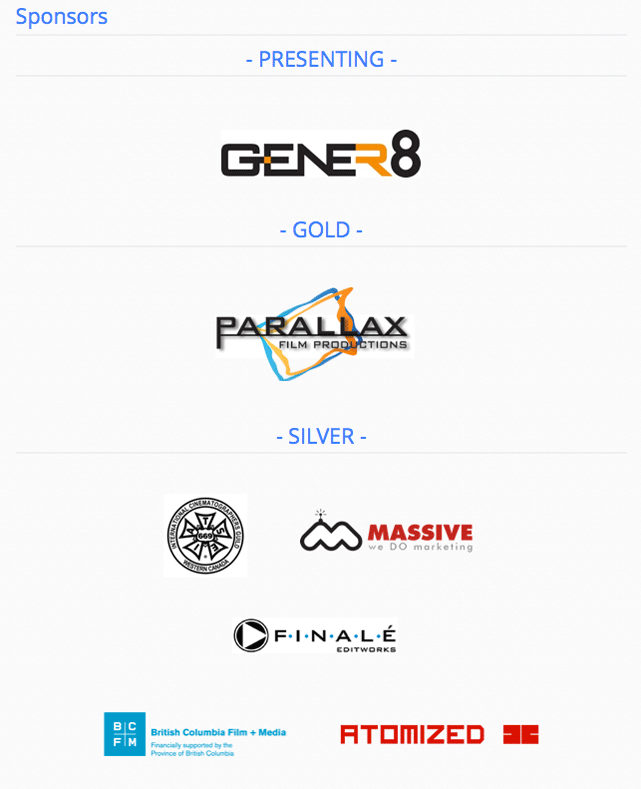 Gener8 is composed of some extremely gifted personell. 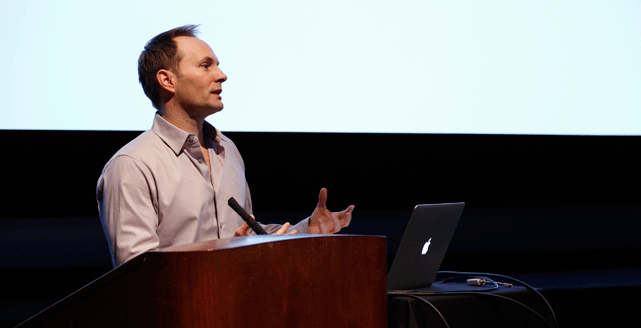 Lasoff himself has won Academy Awards for his VFX work, and Jenkin has worn many hats in this idustry, having also created some of Gener8′s pipelines and software. They have a common goal at Gener8, and Lasoff describes how inside Gener8, they believe the stereographer must be included throughout the process from start to finish. Using their depth assessment process, they continue on to match move of camera, rotoscope, then rotomation. At the very end, they project the frame onto their models. The Gener8 team demonstrated on their proprietary software Stereo Composer this entire process, which eventually ends in final approval to the client. Lasoff continues to state that the entire stereo conversion process is some simultaneously to the VFX pipeline, which is what truly sets Gener8 apart from their competition. On Prometheus, Gener8 had to match the converted footage to match what the excellent native 3D appeared to be. Most of the work done on this project was to correct occlusion, and it was natural to create depth continuity. Whether converting is more affordable than shooting native 3D is completely debatable at this time (hint: it depends on many variables) but there is one thing very obvious: as they continue to put research and develop into their tools, there is no doubt that Gener8′s process will become even more affordable. 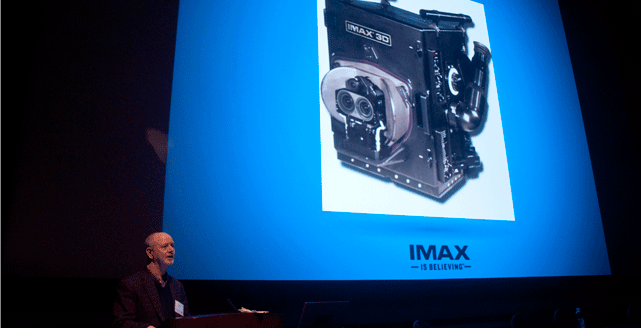 Murray explained how for IMAX before the current 3D revival, their last studio 3D projects were in 1983. The coming of digital 3D created a brand new model for IMAX, and this started with the release of “The Polar Express” in IMAX 3D. Murray explains, “What kept this going were world’s fairs and expos. Everyone wanted to showcase the best technology in their pavilion so we would be called to help. Our first world fair was in 1987, in Montreal.” These expos provided financing for IMAX to complete more testing and innovation that helped make IMAX the game changer it is today. Murray spoke about how IMAX has evolved dome projection in 3D, and spoke a bit to the incredibly complex process of filming and projecting for dome presentations. On several instances, Murray mentions the dome presentations combined with the incredible CG effects created the closest thing he has seen to virtual reality. Complications around shooting fisheye 3D are what pushed IMAX to create their own 3D system. Murray was involved in the engineering and creation of the first IMAX 3D system- from camera to rig and he describes the issues around finding lenses that allow for an interaxial that is practical. Eventually three of these cameras were built, and Murray’s role changed to also include training camera operators to use the 3D systems. One of the first to be proficient in 3D was Vancouverite Noel Archambault, who died tragically in a place crash while filming “Galapagos: The Enchanted Voyage” in 1998. Archambault had worked on every IMAX 3D film until his death, and Murray states that most of IMAXs original staff was indeed from Vancouver originally, hence Vancouver’s rich history in large format 3D. 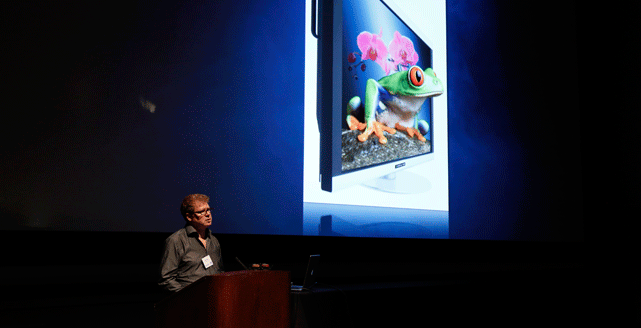 Murray explains what really sets IMAX apart is its ultra immersive experience. “What IMAX is really striving for, is orthostereo experiences. What that means is the cameras are going to shoot parallel, and you shoot with lenses that match as much as possible the perspective the audience will have. You try and match scale and distance in the theatre with what exactly was in front of the camera.” IMAX theatre used to be geometrically scaled versions of each other to perfectly match the narrow dimensions needed. Modern theatres are only slightly different now. “Screen plane was never part of our discussion as stenographers. What screen plane was, was just us asking what the audience would be looking at, and what is comfortable for them (inside the stereo pyramid that included the whole theatre).” IMAX often would shoot stereo infinity on their shoots, and having known what the exact scale of the theatre is, IMAX crews are able to understand while shooting exactly what geometry is needed for the audience. 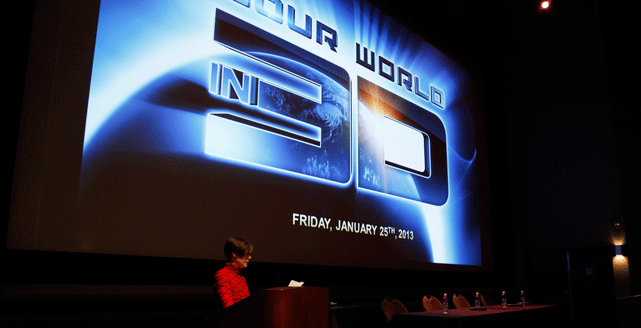 In Murray’s opinion, the 3D projects were what truly built IMAX as a company well into the 90′s. IMAX campaigned to create 3D films for blockbusters from 95′ onwards, and Murray was given a budget to collaborate with Mainframe Vancouver to test some stereo 3D for the show “Reboot”, which led to IMAX completing some conversion work for some already completed 2D animations. IMAX reinvigorated interest in 3D by demoing some experiments that resulted in production of a The Simpsons / Ants 3D compilation film called “Cyberworld” in 2000. “The Polar Express” came on board immediately after, and the reinvention of IMAX 3D films was born from there. Murray describes the process of training astronauts for IMAX’s space films, including the incredible “Hubble 3D”. IMAX has become renown for its space films, and after seeing two 4K 3D clips from IMAX’s “Hubble 3D”, it is certainly easy to see why. Session 7: Advertising & Marketing in the 3D Space with James Stewart, Geneva Film Co.
“Why 3D? People often ask me. And my answer is always: 3D is better. When people see the same content in 2D and 3D, they always enjoy the 3D content more,” starts Stewart for his presentation. He states that he explains a great amount to advertising agencies and producers about what 3D is, and how it can be created. Stewart believes that in many cases, 3D does add to the story, but in other cases doesn’t add a thing. The easiest way to explain 3D to someone is: “2D is a painting, and 3D is a sculpture. 2D is a wall, 3D is a window. Sometimes you come into a lot of cynicism when you pitch 3D to advertiser or filmmakers, but you are in good company if you share enthusiasm for 3D.” Stewart finsihed that sentence by showing some of the world’s most respected companies in film, tv, advertising and media. As to why 3D is becoming popular once again now, Stewart explains that the digital revolution has finally enabled much more creativity and immersion than previous incarnations of 3D. Stewart says regarding 3D conversion that there is a conversion camp, and a native 3D camp in Hollywood that is now starting to collaborate. For Stewart, he claims he is neutral on the subject and sees the value of both in various scenarios. Stewart makes a valid point that with films like “Pina”, “Cave of Forgotten Dreams”, “Hugo” and “Life of Pi”, it can be demonstrated that even those in older demographics have been enjoying 3D. Young people aren’t the only ones now that enjoy the medium. In summary, the event welcomed both veterans from the 3D industries and also those just beginning to imagine how their business could take advantage of 3D. One of the most exciting aspects of both the networking event and the conference was seeing people from cross sections of industry meeting one another and also able to converse with the speakers. 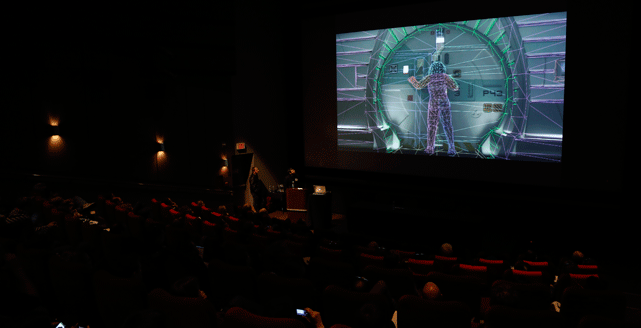 The goal of the Canada Chapter of the Society is to create an environment where people can network, enjoy 3D screenings, and learn about the latest developments in 3D. This event is the first of many that will formalize the stereo 3D community, and hopefully continue the tradition of 3D innovation in Canada. Thank you to all of our speakers, sponsors, and of course the attendees for helping us make an incredible landmark event! Please visit the Chapter Website in February for more information. Don’t forget to follow us on Twitter, @EmilyCarrS3D and @_MassiveMedia to see the live Tweets of the event and stay up to date with the next events. Again if you wish to become a member, contact us through Twitter, or our direct email.